Earlier this year, the company behind Conga Composer built an eSignature product to sit alongside their popular document & contract management solutions. I recommend Composer on an almost weekly basis to my clients, as it’s just a no-brainer for nearly every business out there. If you need to generate quotes, contracts, invoices or any other document with Salesforce data, the admin time that sits behind this will almost always outweigh the cost of Composer. 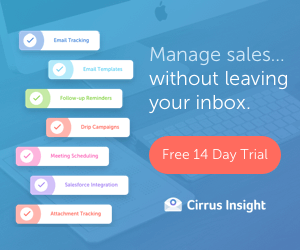 Along a similar train of thought, I think the same is true for any business that has a cloud-based CRM and is not using an eSignature solution. There is almost no scenario where you could not justify the cost of an eSignature Solution! Familiar Look & Feel – Because Conga Sign is built for the Salesforce platform, everything is very familiar. It’s very easy to navigate, and there isn’t an iFrame in sight! 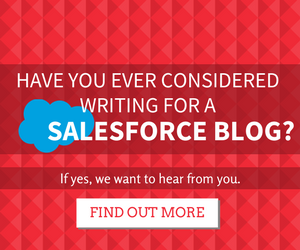 This generally makes the process a lot smoother for existing Salesforce users. Setup in 5 Mins – Applications that are external to Salesforce have to jump through various hoops to integrate with Salesforce. Apps that are native have a much easier time, which is why you can literally go from AppExchange to sending out a document for eSign in less than 5 minutes (Tried and tested). Document Agnostic- Although Conga Sign is a perfect way to compliment your existing Composer or Conga Contracts solution, you can also upload your own files, as well as search for existing Salesforce documents. Use Native Automation – Because Conga Sign uses a custom object to track the status of a document and it’s status, you can essentially bolt on any automation to this. The best example of this is changing an Opp to closed won once a document has been signed by all parties. Conga has their eSignature solution priced very competitively, and as a result, doesn’t break the bank and is easier to justify the cost. As I know so many people that will be reading this post will probably have an existing Conga product, there is a default discounting structure in place so you can get it even cheaper! 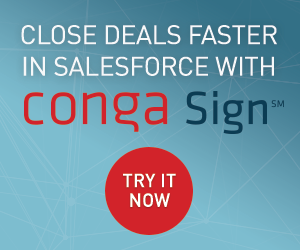 In addition, Conga is offering an exclusive discount just for Salesforce Ben readers. Fill out the form below by October 31, 2018 to receive 20% off Conga Sign. What are you waiting for!